Parchment · 31 leaves · 801 – 825 CE · Lyon ? 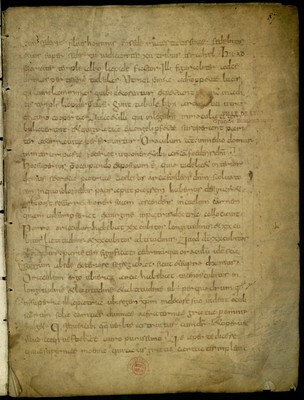 Lyon's City Library and Paris' National Library share parts of a lost copy of Bede's De templo Salomonis, written in the first quarter of the IXth century, that was annotated by Florus of Lyons later in the same century (floruit ca. 825-855). We owe the rapprochement of these fragments to André Wilmart («Fragments carolingiens du fonds Baluze», in Revue bénédictine 43, 1931). They are the manuscript L in D. Hurst's edition of Bede's treatise (CCSL 119A, 1969), but Florus' annotations were never studied before this virtual reconstruction. Cf. Bischoff, KFH II, 2585.